A hearty, quick and delicious main-course salad with beautiful contrasts. anchovy paste - 1 tsp. red-wine vinegar - 3 tbsp. finely chopped basil - 2 tbsp. minced onion - 1 tbsp. Whisk dressing ingredients together in small bowl and set aside. Boil potatoes in salted water until just tender. Drain, reserving potato water. Cook green beans in potato water 4-5 minutes. Drain and run under cold water. Toss green beans, tomatoes and potatoes with some of the dressing. 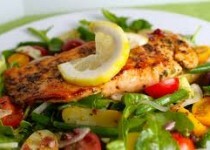 Divide greens among 4 plates and top with vegetable blend, salmon and eggs. 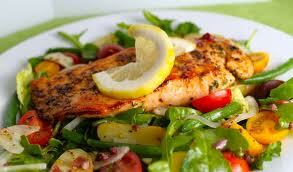 Serve with remaining dressing and garnish with lemon.